After a slow, guarded round of three-handed play, Vladimir Shchemelev took only about 15 minutes to defeat Mel Judah in heads up action for the bracelet in Event 46, $3,000 Pot Limit Omaha Hi-Lo at the 2013 WSOP. The 40-year-old Russian jumped to more than $1.6 million in live tournament earnings with the win. The event marked his eighth final table. With the win, Shchemelev denied Judah his third gold bracelet. Judah last won a bracelet in a $5,000 Seven Card Stud event in 1997, and he won his first in Seven Card Stud in 1989. Shchemelev started the heads-up match with a chip lead of 2.8 million to 1.115 million, and the two were nearly even in chips when the final hand played out. 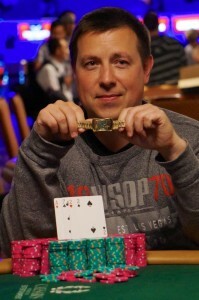 The final table also included three-time bracelet winner John Cernuto. Back home, Shchemelev said he studied physics, but wound up playing poker and gambling because he found the latter more lucrative. He said he’s been playing poker for 22 years, including four years at the WSOP. The final table saw its first elimination shortly after getting underway. Hacker raised to 37,000, Judah called and Alexey Makarov, who started the day with the chip lead, three-bet to 144,000. Hacker called and Judah folded. Makarov moved all in on the K 9 5 flop and Hacker called. Hacker’s set with A 5 5 2 had Makarov in bad shape, holding A 7 2 2 and the turn K and river 4 sent Makarov out in ninth place. Allyn Jaffrey Shulman moved all in and Ashly Butler called. He showed A J J  against Shulman’s A Q 6 4 . The flop of J T 8 gave Butler top set and the turn 7 and river Q eliminated Shulman in eighth. Butler raised to 60,000, with Andrey Zaichenko calling in the small blind. He moved in on the flop of K J 7 and Butler quickly called. Butler turned over A K 6 2 and Zaichenko showed a A T 8 9 for a wrap straight draw. But he could not find help on the turn 4 or river 4 was sent Zaichenko to the rail in seventh place. With Butler on a run, he opened to 50,000 and action folded to Tyler Nelson in the small blind. Nelson bet pot, essentially moving all in and Butler called, showing the A A K  against Nelson’s A K 5 3 . The flop of 6 3 2d] crushed Nelson’s chance at a low draw. The turn A and river J eliminated Nelson in sixth. Cernuto was stopped short of his first bracelet since 2002. Action folded to him in the small blind and he raised pot before Ashly Butler put him all in. Cernuto called and turned over A T 8 5 , which was up against the K 6 3 2 of Butler. The flop of A T 5 kept Cernuto ahead, though Butler had outs to the wheel and the low. The dealer flipped the J on the turn, and the river 4 gave Butler the straight and the low, knocking out Cernuto in fifth place. Brian Hacker raised on the button, Shchemelev potted from the small blind and Hacker called off all fo his chips. Shchemelev showed A K 9 4 and Hacker showed A 2 2 6 . Hacker flopped a set on Q 7 2 but the board ran out T J , giving Shchemelev a straight. That sent Hacker out in fourth. Butler started the final table by rolling over players, and once play was three-handed, he had both Judah and Shchemelev covered. He lost a big pot that doubled up Shchemelev, but kept fighting and regained a small chip lead at one point. Three-handed play was relatively quiet, with steady jabs from each player. Then Shchemelev quartered Butler and had him on the short stack for Butler’s final hand. With blinds at 20,000/40,000, Shchemelev limped the button, Judah folded in the small blind and Butler raised 100,000 more. Shchemelev called and they saw a flop of 9 6 5 into which Butler bet pot. Shchemelev quickly moved in and Butler called for the rest of his stack. Shchemelev had flopped a straight, holding A 8 7 2 and Butler needed a lot of help. He did not get it, as the turn and river fell 4 and T , eliminating him in third place.